Why replace a kitchen counter? Maybe it’s dated, worn, or damaged. Or, maybe you're ready to swap out your sink for an under mount model. Under mount sinks make cleaning your counters a breeze (just sweep it right into the sink, no lip to catch on) and are definitely add value to your kitchen. First, make sure that the condition of your cabinets warrants replacing just the counter. If they are not working at 100% or if you think you might want to replace these later, then hold off. You can't replace the bottom without replacing the top. If you currently have a stone counter and it has cracks, be aware that this may be the result of the cabinetry underneath not being level (or stable). Before you invest in a new one, make sure the cabinetry is flush, or that the installer can correct for any inconsistencies. 1.About the backsplash: If you have a tile backsplash, that tile is most likely sitting on top of the old counter. So, when you pull the old counter out, some of those tiles might break or come off. If you plan to keep the same backsplash, make sure you have some spare tile to deal with any repairs. 2. How's this thing stuck on? : A friend recently had a counter company in to remove the old counter (which incidentally you’ll want to make sure is included in any estimates) and they had a tough time removing the counter because it was glued to the cabinets. They would not guarantee that the cabinets wouldn’t get damaged in the process. When the contractor or counter company comes to template the counter (or look at the job), have them take a look to assess the situation. 3. We're all connected! The sink is connected to the plumbing and this plumbing will need to be disconnected to remove the old counter. 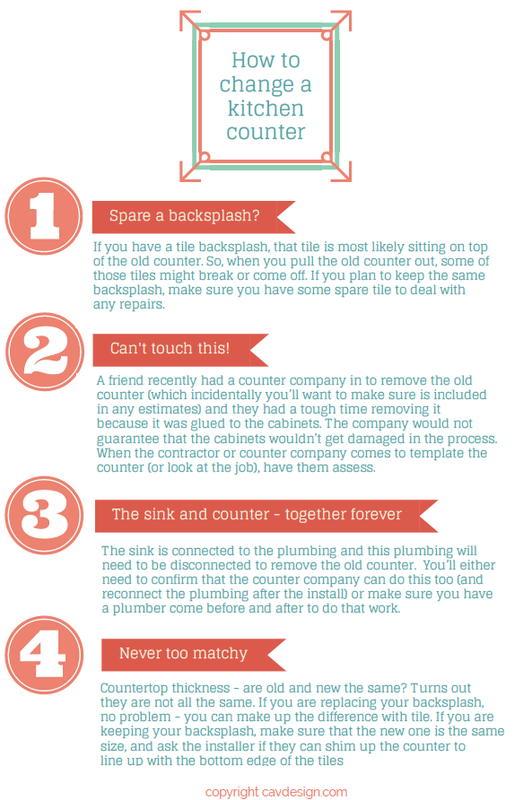 You’ll either need to confirm that the counter company can do this too (and reconnect the plumbing after the install) or make sure you have a plumber come before and after to do that work. 4. Countertop thickness - are old and new the same? Although 1.25" is the standard for kitchen counters, not all counter surfaces are made to this standard. If you are replacing your backsplash, no problem, you can make up the difference with tile. If you are attempting to keep your backsplash, make sure that the new one is not thinner, or that the installer can shim up the counter to line up with the bottom edge of your tiles. What counter material should I use when I'm ready to go? 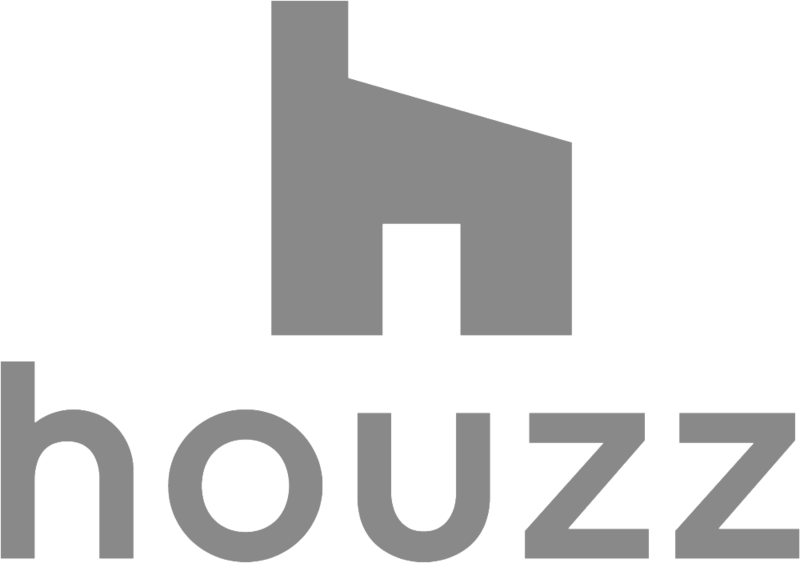 I’m just going to say that my favorite material is quartz composite like Caesarstone, Silestone, and many other brands. It’s durable, consistent in color, and maintenance free. Got any questions? Let me know! 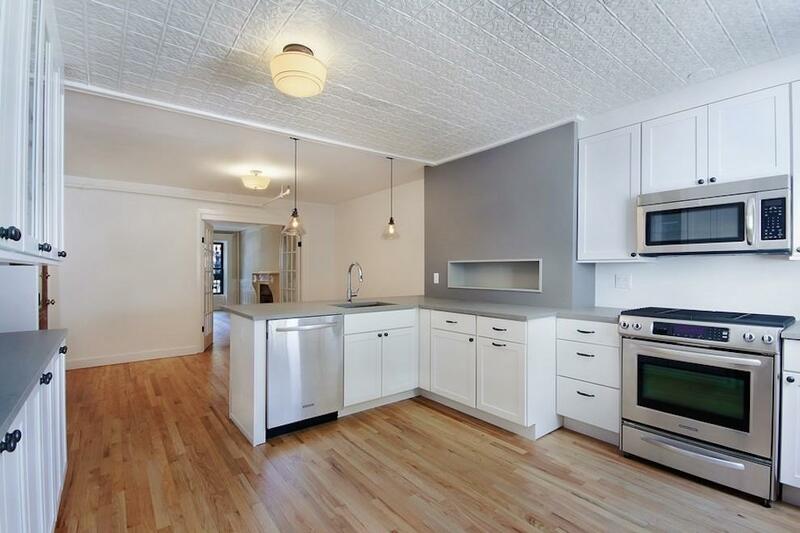 The new owners of this Park Slope brownstone called me in for paint and furniture, and then we got to talking about the kitchen... It started with paint, then a banquette, then replacing countertops, then replacing the island, oh, and how about a 36" cooktop instead of the 30"? The list grew. This is part one of what I call the cascade effect -- once you start to take a closer look, well, a lot of things just don't work anymore. In any case, we all agreed the yellow walls had to go and a calmer cooking environment was in order. Thus, the kitchen makeover began. The thing about a retrofit, however, is that you really have to proceed with caution - once you start cutting, changing and touching stuff there is another thing that has to be done to accommodate it -- this is part two of the cascade effect. Below is a basic before and after, as well as the list of what we did, why and what the 'add-on' moment was -- that's the moment where you realize that if you do this, you might have to do that, which adds on to the project at every step. Here's the list of what we did, why, and what the 'add-on' moment was. 1. Replaced the island with one that accommodated a 24" dishwasher where there had only been an 18". Why? since we were keeping the other cabinets I decided it would be best if we do something completely different, that didn't look like it was trying to be a match. Thus the flat panel style and dark color. Add-on: We avoided an add on by keeping strictly to the same footprint of the existing island so we would not have to do any patches on the floor. Also, kept plumbing in the same place to avoid extra costs. 2.Replaced countertops with Caesarstone in London Gray. Why? The Corian looked dated and the Caesarstone looked awesome and was easy to maintain. Add-on: As soon as the countertop got removed, the backsplash needed to be replaced. 3. Replaced the 30" cooktop with a 36" Viking cooktop, and Viking wall oven below. Also replaced the GE fridge with a Sub-Zero. Why? the client really wanted a 36". I was reluctant since the space was only 30" but I managed to do some fancy cutouts with my cabinetmaker to make it work. As I suspected, we lost the use of the top two drawers in the process. The Sub Zero also required a careful install to prevent tipping. Add-on: with any retrofit of appliances, especially those involving gas and electric, look very closely at the installation diagram and the location of the existing supply. We needed the assistance of a cabinet maker, plumber, and electrician to make this whole thing work. Why? Did you see those cushions??? Add-on: Again, since we were replacing cushions with something different, we had to spend extra time selecting fabric and working out all the details. 5. Replaced a ceiling fan with pendants. Why? 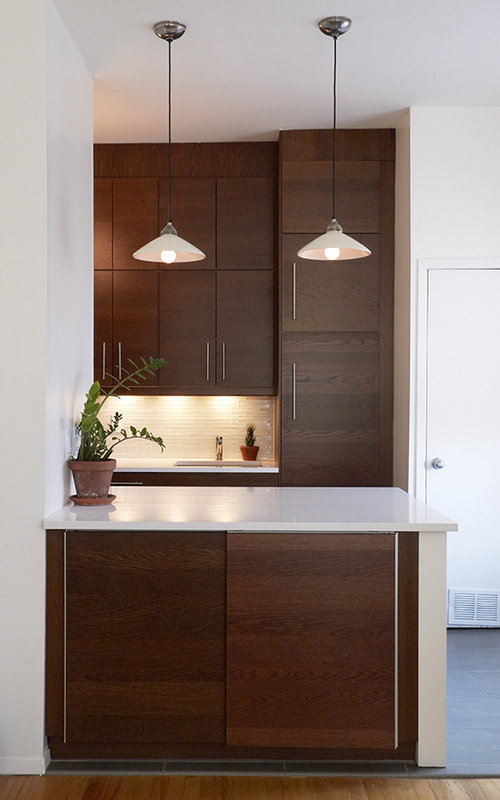 We all agreed that pendants would add character to the space. Add-on: As soon as you touch that ceiling, you have to paint the whole ceiling. So we did. Why? At first we thought we could just replace them, but no go -- the size was odd and nothing suitable was available. Add-on: The powder coating was the add-on, but I actually think it turned out cheaper in the end, except for the time it took to pick up and drop off the handles and find the place to do it. Add-on: working out the corner near the banquette - always think about how your tile will finish when it turns a corner, or terminates with the edge showing. 8. Modified the cabinet near the back door to accommodate a pullout trash. Add-on: One of the most time-consuming add-ons in the whole kitchen, and you'd never know. The cabinetmaker had to build a completely new box for the cabinet (what we thought was a 24" deep cabinet was two back to back 12" cabinets), which it then turned out was a little too shallow for many of the pullouts. So, we had to spend a fair amount of time finding one that fit. There was also electrical running through the cabinet which had to be re-routed. 9. Wallpapered the back of the cabinets. Why? 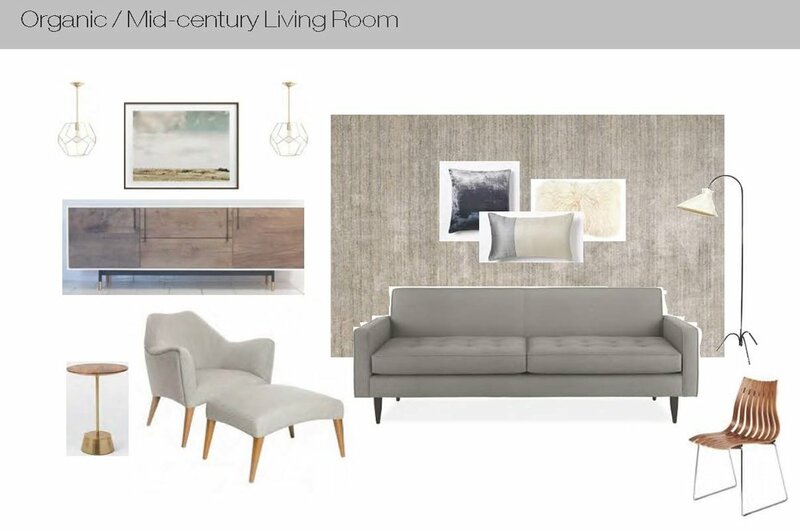 To add interest and detail to a monochromatic scheme. Add-on: The client (and I) really liked a fabric over any of the wallpaper options we had seen, so I had to send the fabric out to be backed with a material to make it possible to use as wallpaper. Also, for an installation this small it would have been very pricey had we not bundled it with another wallpaper job in the same house. Why? yes, well, they just couldn't live with that yellow. Add-on: I have to say that this was the one thing that didn't come with any surprises. I love paint! Here's another pic of the wallpaper/backsplash area - oh yeah, replaced the sconces too. 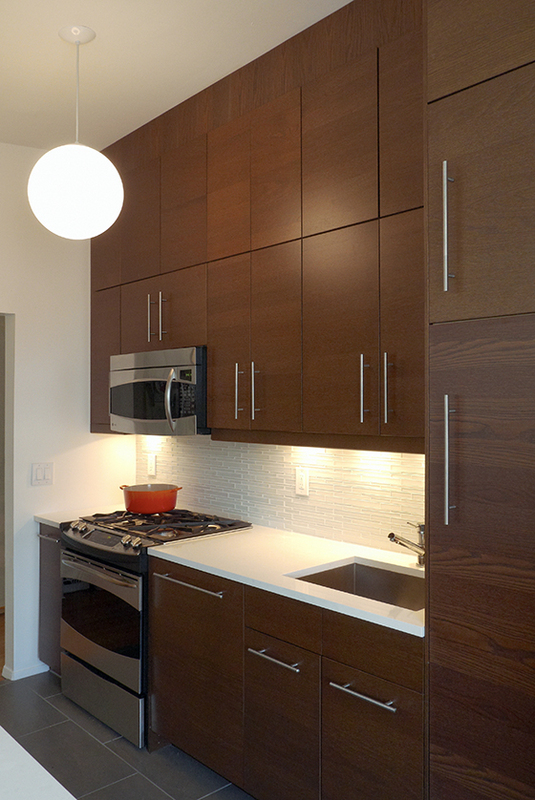 We've just completed a renovation in Bed-Stuy for an out of town client. It's a great example of walking in and saying, "what did they do?" That's really the best thing in this case - the goal was to make it look fairly untouched and keep an eye to the past. We kept original details and did a lot of clean up, but we avoided sheetrock and used a lot of careful painting from painter extraordinaire, Jamie Grubb. 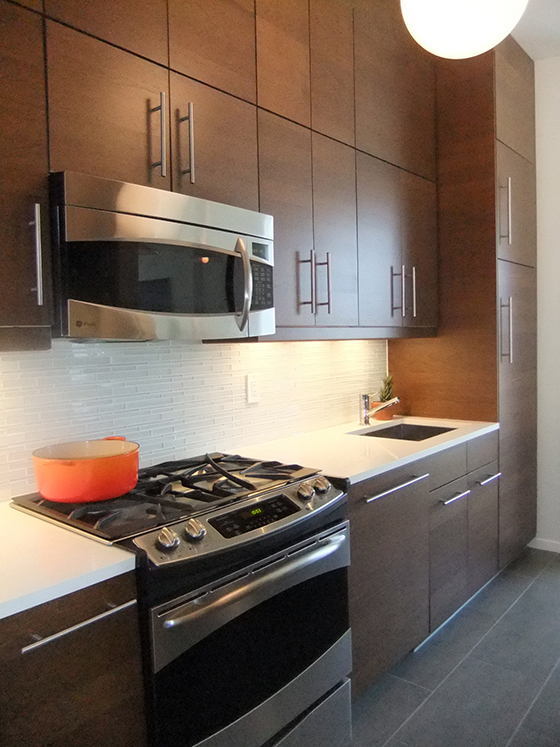 The project was just listed by Corcoran and both the client -- and CAVdesign -- couldn't be more happy with the results. 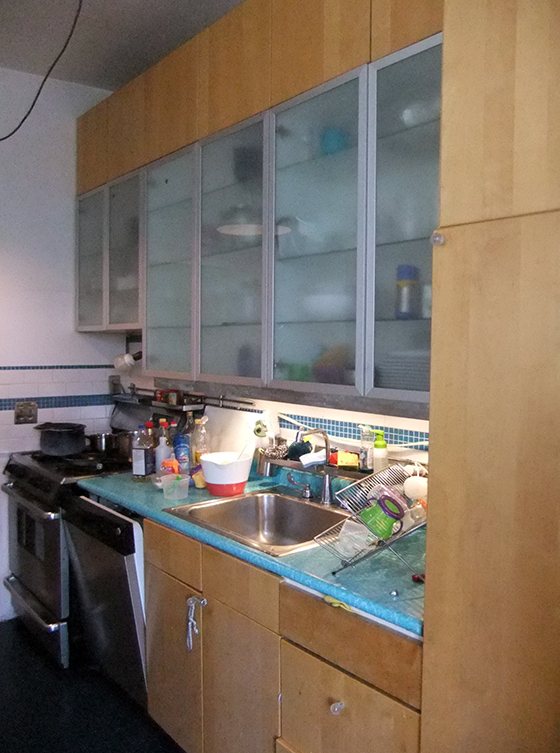 Here is the garden apartment kitchen before. The chimney area had some storage, but it interfered with the possibility of extra counter space. 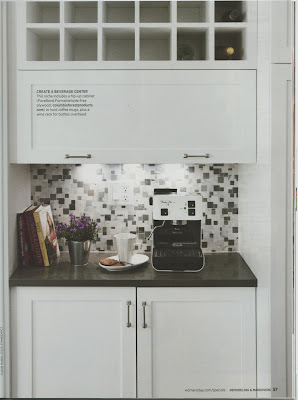 The solution: We placed a niche inside the space and opted for better counter space and storage. The chimney wall was painted as a feature area and became a handsome detail. The overall layout was not bad, and I actually liked the idea of the peninsula with additional seating. But, in this case it was too high, too shallow, and too, well, ugly. We made the bar area counter height to increase the useable counter space and open things up, and put shallower base cabinets on the right side to create a more open plan. The parlor floor was in decent shape but needed painting. The owner was wonderful about investing in expenditures like re-wiring the original light (which was dangerously not to code). We opted to paint some of the woodwork to brighten up the space. It was in poor shape and in the end, it really did work to the advantage of the space. We kept anything in good enough shape as original. Final touches included a cleanup of the backyard with landscaping. This extraordinary client was so understanding about what it would take to do these upgrades and more (including a full electrical upgrade). If you ever are considering investing in an older building, keep in mind that holding on to original details may cost more than covering them over. In this case, we tried not to go overboard, but held on to the best of the detail while gently sheparding the building into the 21st century. 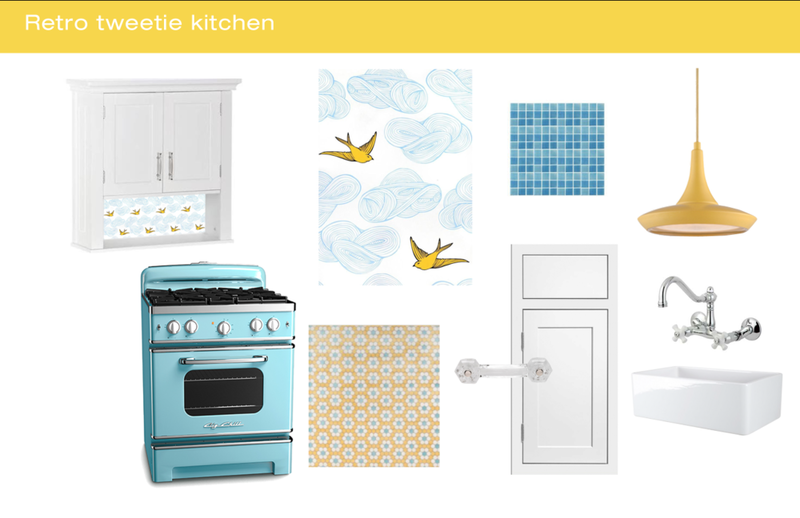 Free Kitchen and Bath Workshop! OK, so it's been a while.... Why? There are lots of new and exciting things in the works, including a completely re-designed website and blog (almost ready), and the first in a series of Design Coach e-books, The Design Coach Guide to Kitchens which will be available in December on my site and others. To celebrate I am giving a free workshop on kitchen and bath renovations, hosted by the nice folks at FLOR | Brooklyn on Thursday, November 15th from 7:30-9:00 where I will be sharing insider tips to help you avoid common pitfalls and make the most of your renovation budget. 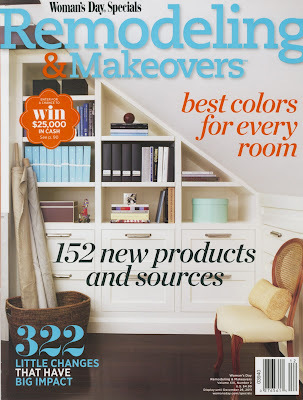 You'll also have the chance to win some great giveaways including a FLOR twelve-tile rug (excluding wool), a Design-Coaching session with yours truly, and copies of the e-book, The Design Coach Guide to Kitchens. AND there will be light refreshments -- it just gets better and better!I really hope to see you there, it's sure to be a fun evening. The event is free, but space is limited, so click on the button below to register. In case you are not familiar with the Sweeten, they pair folks looking for home design, repair, and renovation with a perfect match, selected from their carefully screened tradespeople -- kind of like a dating site for homeowners, contractors and architects/designers. Members also get updates and newsletters like the one below featuring a CAVdesign project. You'll see from the befores and afters that the new storage really helped the homeowners tidy up the place! Thanks to the Sweeten for thinking of CAVdesign. Because of our New York Magazine coverage we’ve got a bunch of new projects in the works. They are all in the early stages of construction though. 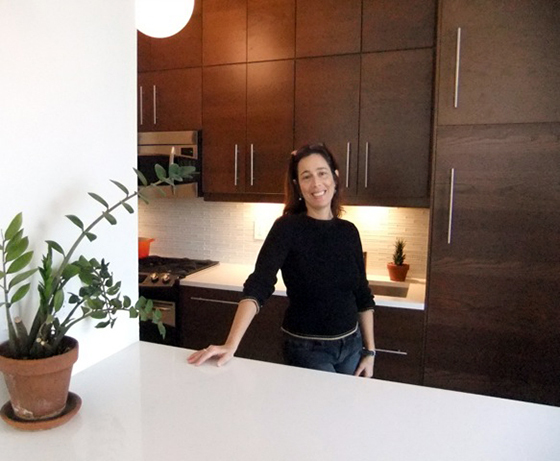 So, for this week's 'site visit', we asked Jennifer of CAV Design to give us a tour of a kitchen renovation she finished in Boerum Hill, Brooklyn just under a year ago. Below are some images of the project and you can check out this awesome video as well! 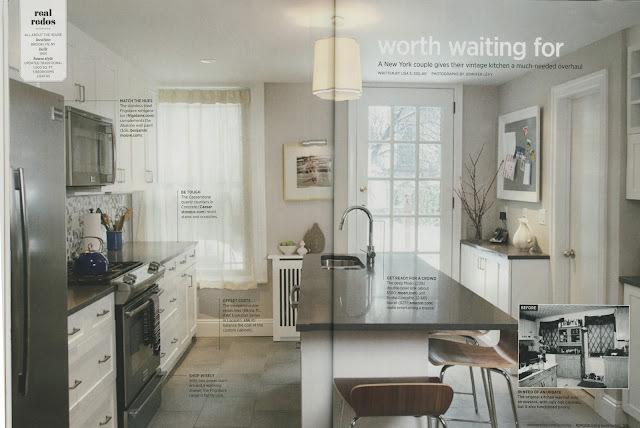 The client for this project, a travel writer who loves to cook, was looking for a more streamlined and functional kitchen for his young family. Jennifer explained that one of the constraints she was working with in the redesign was a limited budget. 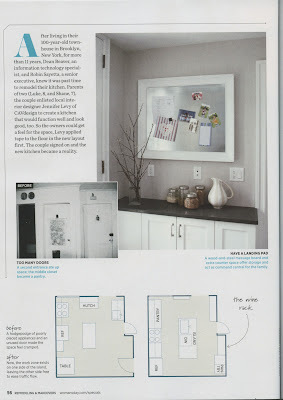 This was of no consequence in the end, as she beautifully pulled off a custom look with an Ikea kitchen! Here’s Jennifer, owner of CAV Design. A couple of 'before' shots. 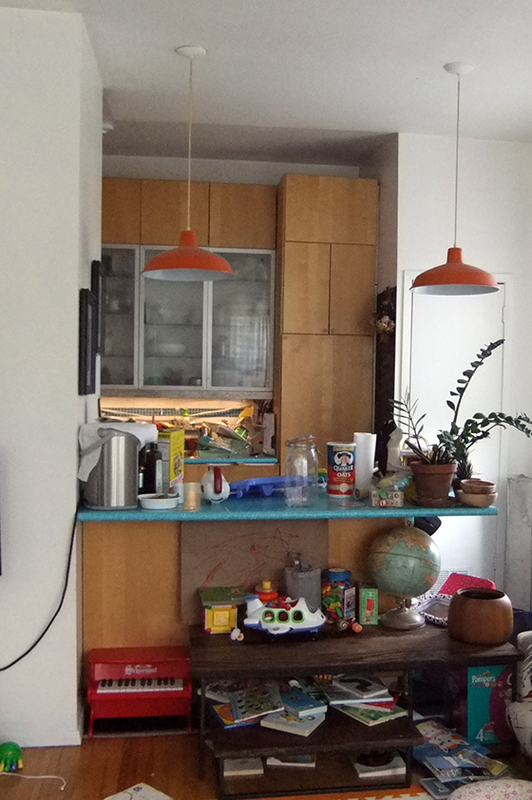 The clients weren't totally satisfied with the look and functionality of their existing kitchen. And here's a head-on view of the great changes CAV Design brought. Working with these Nexus Brown Ikea cabinets (no longer available, sorry! ), Jennifer was able to increase the available storage by expanding the island, as well as running cabinets up to the ceiling. The ceiling-high cabinetry also reduces dust space overhead, and creates an appealing effect of built-ins! Jennifer knew that major changes to the appliances would end up causing problems with the budget later on. Taking this into account she was able to make some subtle, yet substantial improvements. The oven was moved to the right by 12". This added some space for a narrow cabinet. Then, to avoid the overbearing look of 2 appliances next to each other, the dishwasher was replaced and perfectly camouflaged with a Nexus Brown Ikea dishwasher! For the new floor, Jennifer went with an oversize ceramic tile, 12" x 24" in "Roca Azila" from Brooklyn's Galactic Tiles. Counter-intuitively, large floor tiles can make a small space look bigger. Great work & big thanks, CAV Design! The Sweeten can help you find and hire the most talented & dedicated contractors, designers and architects in nyc. Copyright © 2012 Swee10, Inc, All rights reserved. Undermount Sinks - The smallest and the best! 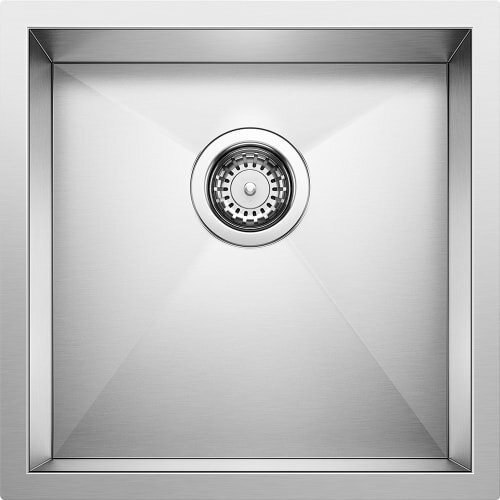 Problem: Finding a great undermount sink for a small base cabinet. I love deeper sinks (8"+ depth) and double sinks, and always recommend them to clients, but deep or not, options are limited for sinks that fit into 30"cabinets... and they become even less bountiful for 24" cabinets. When you're designing for a New York kitchen, it's likely that you'll want more drawers than that open space under the sink for storage, so small sink cabinets are a common solution. 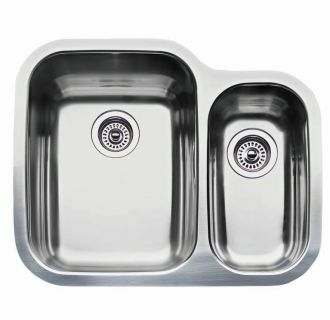 It's nice and deep, which is helpful for cleaning pots as well as for limiting splashing and the second bowl is a good size, which is so hard to find in a double sink. For a 33" cabinet, the Moen Lancelot 22392 is my hands down favorite. While many companies make a 33" sink cabinet, IKEA doesn't, so you'd have to use a 36". 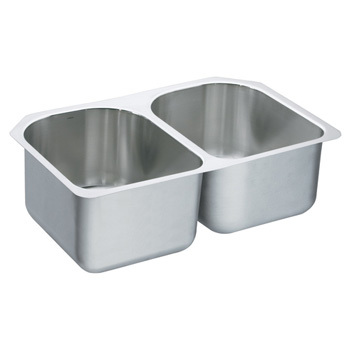 This has nice deep bowls, and the second bowl can be used as a dish drainer to keep the counter space free. a good option at around $400. Also, IKEA makes the BREDSKÄR, a great-looking sink that can be undermounted or rim-mounted on the counter. It's easy on the budget at $256, but I'm not sure that it comes shipped with the clips for undermounting, so your countertop fabricator may have to supply these. 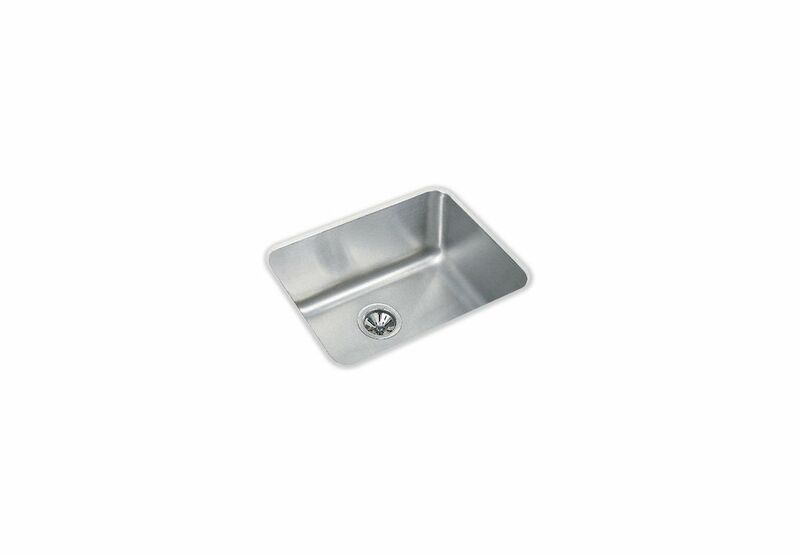 This Kraus sink has a nice deep 9" basin and is also a great price at $159, which includes a rack and a drain! And this one from the precision collection at Blanco has these these stylish drain grooves. Cool! Buying tip: most sinks are sold separately from the drain, so remember to buy the drain, and get two for a double sink. 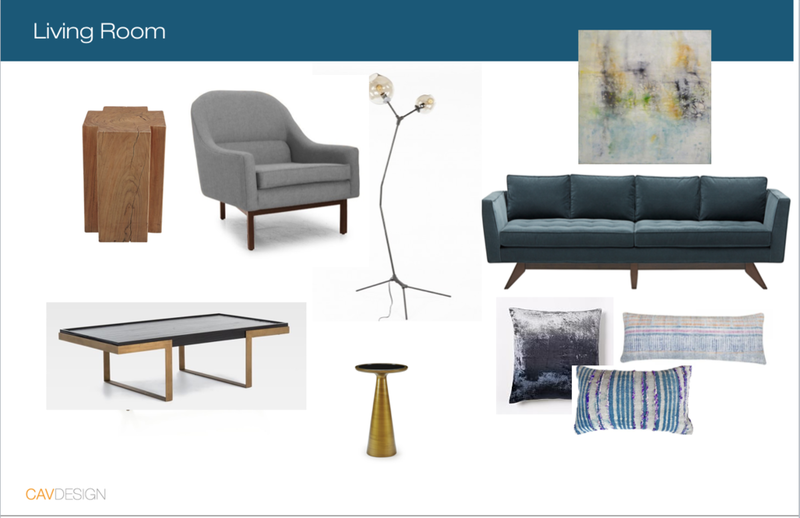 Happy to say the CAVdesign is one of the featured design professionals for August on thesweeten.com. 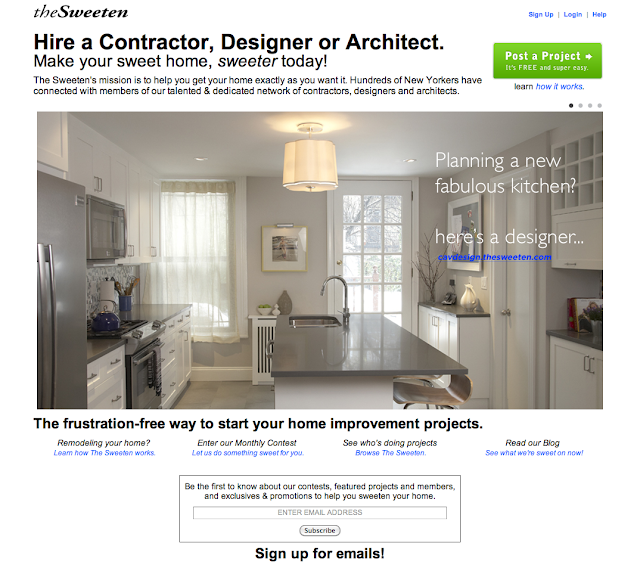 The Sweeten is a website that connects homeowners looking for home improvements to qualified contractors and designers. Anyone can post their project needs, and then The Sweeten will hand pick the best pros for your job from their vetted (by invitation only) group of builders and designers. They also hold monthly contests (most recently the prize was for Flavor Paper wallpaper with installation!). I know how hard it is to find great people to do home improvements, and I've already located a great cabinetmaker I may be using for my next custom built-in. There's no obligation to use their recommendations once you post a project, and you might just find the perfect fit!